What a great Wednesday! I woke up at 4:30a to get a run in… you know, I love to hate the heart rate monitor! I haven’t used it in forever and already noticed a change between not using it and using it – it’s just hard maintaining a constant heartrate between 149-159 and not going to high or low. After my hour and ten minute run, I met up with some of the Resident Directors to do some core work with tractor tires!! It was great! 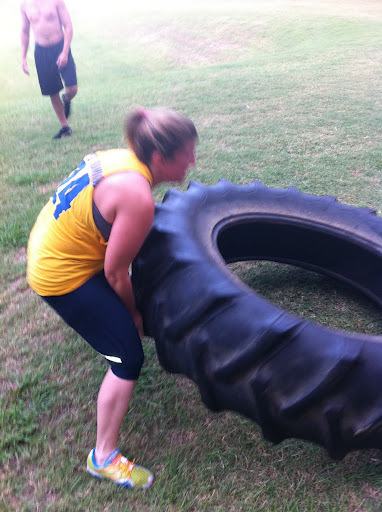 We started by pushing it back and forth for a few sets with our partner… this was with the big tire you see! It only weighed around 300 pounds! 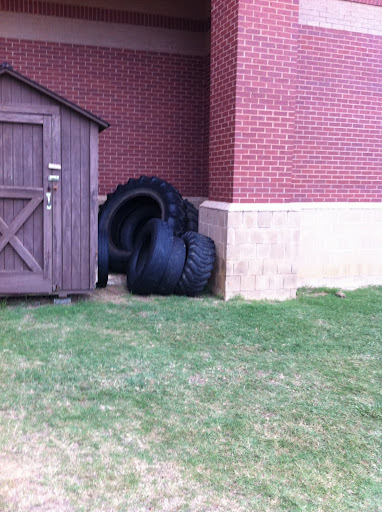 Then it was time for 10 sets of 5 tire flips… I did 3 flips with the big tire and then had to downsize to the 150 pounder! Then it was all about time… we decided next time we’ll be better prepared with a clip board to take our 10 times down to be better able to gauge our progress as we continue on. Maybe next time I’ll sport the tire as I’m lunging…. although Joe told me I’ll have a weight vest to sport next time! Great workout guys and it was awesome to switch it up from my normal day to day stuff! It’s gonna be a great year! Sunfish Triathlon – RACE REPORT! !